With those two sentences my annual gavel-to-gavel coverage of the NEA convention for 19 consecutive years comes to a close. NEA didn’t explain why this year was any different from the previous 19, and it doesn’t really matter. The union is a private organization, and it is well within its right to issue a press pass or deny one to whomever it chooses. For the record, NEA always treated me in a professional manner during the four-day event, and I always behaved likewise. My first Representative Assembly was in 1998, a landmark year: delegates debated and voted on whether to merge at the national level with the American Federation of Teachers. I had done in-depth reporting on how this issue was playing in the states and quickly concluded that the merger resolution could not achieve the necessary two-thirds majority. Most education reporters at the time viewed my position with bewilderment: the NEA Executive Committee had unanimously approved the merger, and the union’s board of directors had approved it with a two-thirds majority. 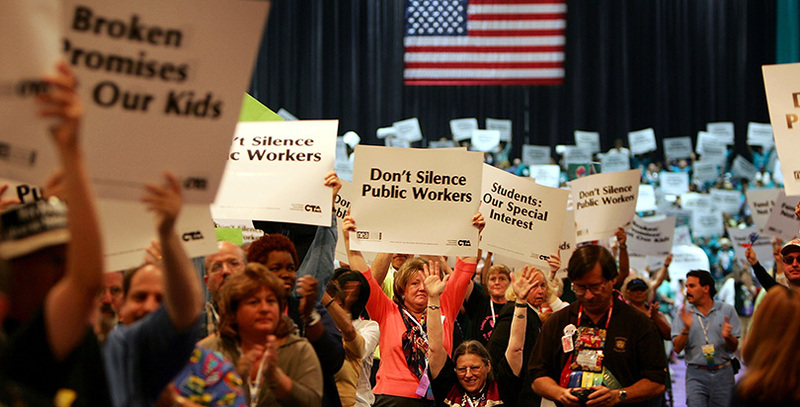 Pro-merger delegates at the convention were angry because I’d said I “predict flatly that merger will not achieve the necessary two-thirds majority at the NEA Representative Assembly in New Orleans on July 5. In fact, there is an outside chance it will not achieve a simple majority.” I again predicted the failure of the merger on the pages of The Wall Street Journal the week before the vote. The merger failed, with only 42 percent support. That vote was a launching point for me, with NEA issuing a press pass in subsequent years recognizing me as a “legitimate news-gathering organization,” as they put it in an email back then. The convention never again lived up to that level of drama and intrigue, though I felt it was necessary to continue on-site coverage because the public still had no access to the union’s resolutions, legislative program, new business items, or even accurate state-by-state membership numbers. That has changed in recent years, and with the advent of social media it is a simple task to monitor the proceedings contemporaneously on Twitter. So although I won’t be there in person, I will still cover the convention and post my analysis. There isn’t much I’ll miss about the NEA convention, but one is the stream of delegates who would approach me with information, attaboys, or denunciations. It’s unhealthy to only engage with people who already agree with you, so I like to think we provided each other with a benefit. Perhaps my favorite encounter was with former NEA president Reg Weaver. Best wishes, Reg, and all the other NEA delegates who made those conventions much more interesting.